Illustration of the Oksenøya Centre in ZEN pilot project Fornebu, Bærum. Illustration by L2 Arkitekter AS in connection with drafting the zoning plan. In Spring 2018, the Fornebu area was appointed a laboratory and test area for reduction of greenhouse gas emissions. In the ‘Climate Strategy 2030” of the municipality of Bærum, it is written that Fornebu shall be established as a zero emission area by 2027. In the coming years, several low carbon projects will be conducted by public and private actors. Within 2025, fossil free public transport solutions to and from the area, will be established. The planning of a light rail path connecting the area to the centre of Oslo, has already started. The Fornebu area will contain urban structures that will facilitate low and zero carbon mobility within the area, including pedestrian walking, bicycling and electrical vehicles. Fornebu is a peninsula in the Oslo Fjord, covering a land area of about 3.1 km2. It is located about 9 km south of the centre of Oslo, and about 8 km from the local centre Sandvika. From 1939 to 1998, the area served as a regional/international airport. By the end of 2017, the area contained 2 400 dwellings and about 25 000 work places. The area contains a shopping mall (Fornebu S) that encompass 80 shops, cafes and various services. The area is still under development, and large green/brownfield sites are awaiting development. However, most of the technical and green infrastructure have been established. The municipality of Bærum has put forward 2 possible pilot projects at Fornebu: the development projects at Oksenøya and Tårnet community centres. Bærum municipality will facilitate these development projects to become areas for research and innovation and knowlegde sharing. Important stakeholders for the development of the Fornebu area include several private developers (OBOS, Selvaag, Aker and KLP), as well as energy and transport companies. 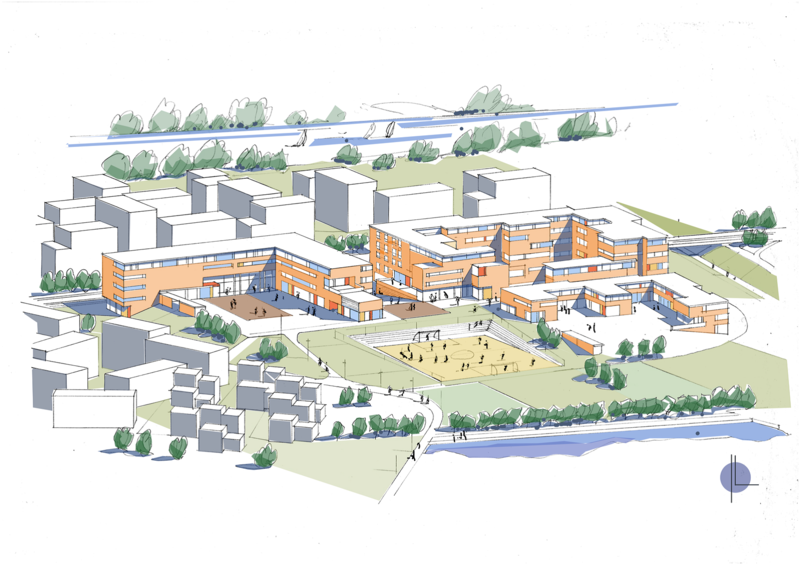 At Oksenøya, the municipality plans to construct a kindergarten, a primary school, and a residential/health care centre for elderly. The construction of these building will be finished by fall 2022. The project is a part of the Futurebuilt program, and will be certified as BREEAM-NOR Excellent. A design-built competition was announced in spring 2018, and a team will be selected in August 2018. All buildings should be certified according to BREEAM-NOR Excellent. Integrated energy strategy with the aim of testing smart solutions for power management, storage and exchange of energy between buildings. Local renewable energy production that is designed to keep import and export of energy as low as possible. Visualizations of energy and power performance to the users. Near Zero energy buildings, minimum passive house standard and energy class A. Reduction of carbon footprint of 50% compared to a reference project, including materials, energy use and transport. Long lasting and low maintenance materials. The development of Tårnet centre is expected to start as soon as the community plan KDP3 is accepted during spring 2019. In the early phases of development, the municipality wishes to explore the potential for developing innovative solutions with respect to smart and sustainable mobility, spatial qualities, sustainable behavior, and new processes of cooperation.